Small Plants & Flowers (you want your plants to stay small - keep this in mind when choosing plants for your fairy garden). Small Fences (can be made from branches or found at local craft stores with the dollhouse furniture). Red, White, Green, Blue, Purple, and Yellow weather resistant paint (to paint flowers and vines on your fencing, to create red/white "toadstools" with some of your river rocks, and to paint your small birdhouse. 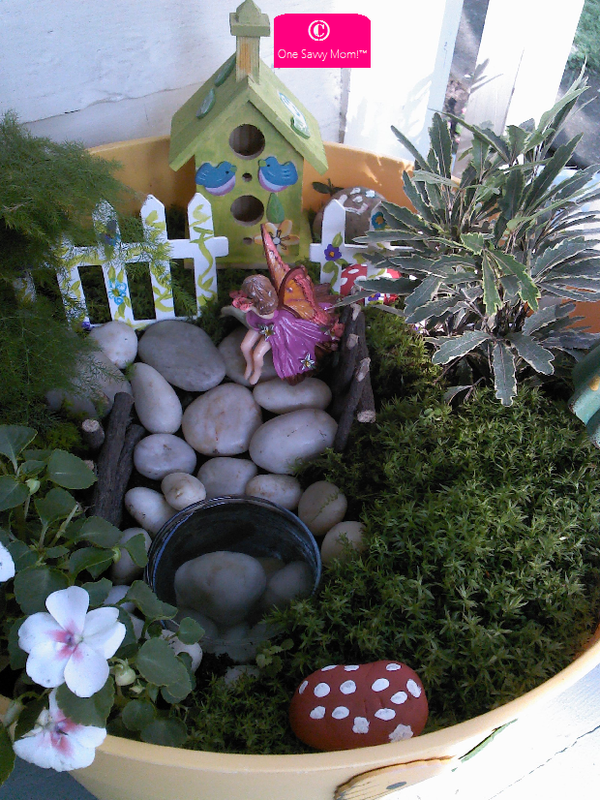 A small container or bowl (to create a small "pond" for your fairy garden). A small wooden birdhouse to create a home for the fairy house (also can be found at local craft stores and at a variety of other retailers). Paint your fencing, decorate them to your own preferences with small flowers and vines (set aside and allow to dry). Paint 2-3 river rocks to resemble toadstools - red with white polka dots (set aside and allow to dry). Paint the small birdhouse structure to your own preferences (set aside and allow to dry). Fill your container with potting soil (leave about two inches of space between the level of your potting soil and the top of the pot). Plant your plants and flowers around the perimeter of your container. Cut your moss and fit it accordingly to your chosen layout for your fairy garden. Dig a small space large enough to fit the container for your "pond", but don't place it in just yet. Arrange the river rocks, creating a small "path" to the area that you've allotted for your pond. Push your fencing in to the potting soil create a cute border to the area where you'll be placing the house. Place your fairy house in the area behind your fenced border. Arrange your (now dry) toadstools around your fairy garden. Place the small container that you've chosen for your "pond" into the hole and fill with a 2-3 river rocks. Finish by filling your pond with water. 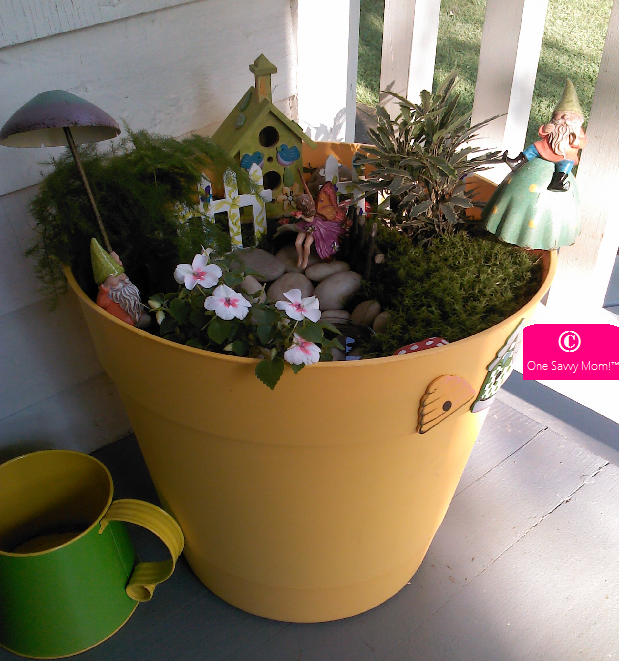 Have your child place small fairy figurines in their new fairy garden home. 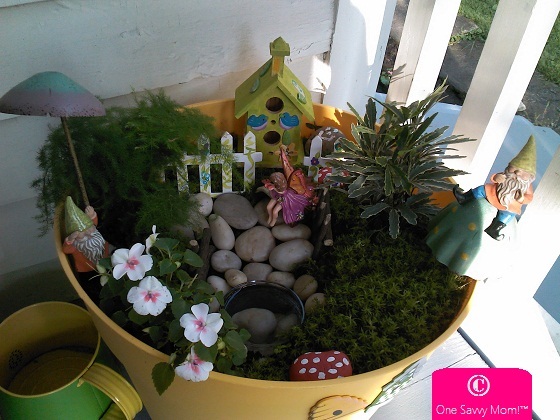 Your child will delight in playing with their new whimsical fairy garden, all Summer long! They'll also find pride in tending to their very own garden! Remember to mist & water the moss and plants in your fairy garden regularly, and most importantly -- HAVE FUN!